468 Big Block Extremely Aggressive First Start! - Muscle Cars Zone! If you are an engine fanatic and love them as much as we do, you would probably understand why we love to listen to the amazing sound powerful engines make. There is something special about it, something that will make your blood boil and just keep looking for more and more. Hereby, we take a look at this video in which an extremely powerful 468 Big Block Chevy engine is put to the test and started before being installed in the car. So, the engine is placed on a base and is connected to a battery. This 468 Big Block Chevy engine starts up without any problem and it does indeed sound and look absolutely amazing. It is going to be installed in the furious Corvette that can be seen in the background. 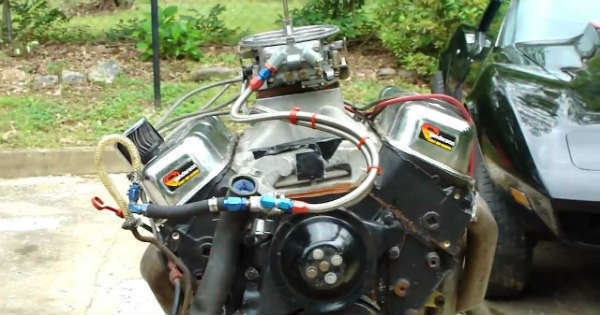 As it is said in the description of the video, the engine was started up for the second time hence in their first attempt, the hose slipped out of the can. It was simply too short. But there is no problem now and everything works just fine. The Chevy engine roars like a beast and every car lover simply cannot wait to see it installed in that Corvette. Moreover, it seems like they restored and repainted the Corvette to mere perfection and it looks absolutely stunning. What do you think, how fast will the car go after this magnificent Chevy engine is installed in it and is this one of the best restored Corvettes you have seen?